KANDAHAR AIRFIELD, Afghanistan -- To the Soldiers assigned to Train, Advise and Assist Command-South, Army Maj. Nathan Wall, with the California Army National Guard's 40th Infantry Division, is known as the deputy logistics and medical operations officer for the unit. However, when back home in Loma Linda, California, he goes by Dr. Wall, especially to the students of Loma Linda University School of Medicine, where he is a professor. "I teach molecular genetics and biochemistry to first- and second-year medical students," Wall said. "I am also the program director for the Ph.D. programs in biochemistry and in cancer biology for the Ph.D. students." Wall said he also leads a research group within the university that studies the biochemical and genetic issues associated with cancer. "We focus on the understanding of how cells undergo a process called apoptosis, or programmed cell death, in hopes that by understanding this process we can design experimental therapeutics that will induce this phenomenon in cancer cells," he explained. With a very active role in the university, Wall manages to balance life as a professor and a California Army Guard Soldier. 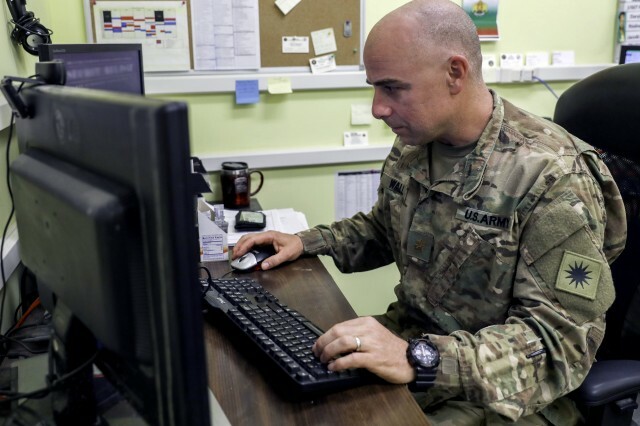 "Maj. Wall is a caring and thorough officer," said Army Maj. Erik Underwood, logistics officer for TAAC-South. "He truly embodies what we call a citizen-Soldier; he is exactly what type of leader and Soldier the [Army] National Guard looks for." Wall said he was motivated enlist after watching the fall of the twin towers of the World Trade Center in New York on 9/11. "It was heart wrenching, and I knew then that I wanted to join Army," Wall said. At the time, Wall was at Yale University completing a post-doctoral fellowship and chose to complete his original plans first and did not join the Army immediately. Following Yale, he moved with his family to Massachusetts to complete his second post-doctoral training at Harvard Medical School. "It wasn't until I finished my training at Harvard and moved to California to work at Loma Linda University that I was able to commission with the California Army National Guard," Wall said. "I have been in the Army for 10 years now, and I can say I have never had a bad day in uniform." During his time with the California Army Guard, Wall has served in medical, logistics and operations specialties. While each required a different focus, Wall easily made the transition. "[He] has transitioned from the medical side to logistics very well and has been able to tie both branches," said Underwood, a native of Yorba Linda, California. "His desire to learn, as you can see from his educational background, I believe, has made him successful in his transition." Wall gives credit to his wife and kids for his successes as both a professor and Soldier. "I would have never joined [the Army] if my wife wouldn't have joined with me," Wall said. "Even though I am serving [in Afghanistan] now they are serving back in the states in my absence." Though Wall and his family have to deal with separation during deployments and training as part of military life, it's something the family has experience with from Wall's time in graduate school. Serving in uniform and educating others in the classroom complements overlap each other, Wall said, adding he doesn't consider himself only a professor or only a Soldier -- he's both. "For me one makes the other better," Wall said. "As a Soldier, the skills that I am able to develop affect who I am as a professor, as a father, son and spouse and vice versa." As his nine-month deployment at TAAC-South nears the end, Wall said he is excited to see his family and his students back at Loma Linda University. "Whenever I get an opportunity I take some time to put some of my lessons together in preparation for my return to the school," Wall said. "I am very thankful for the university and their patience and their ability to let me be a Soldier." Underwood said he feels grateful to have had the opportunity to have Wall as part of his team during the deployment. "I think our unit made a great decision in picking Maj. Wall for this deployment," Underwood said. "He has done a lot of good for Afghanistan and TAAC-South. The fact that he has a very successful career in his civilian life shows how patriotic he is and how much he wants to serve his country."